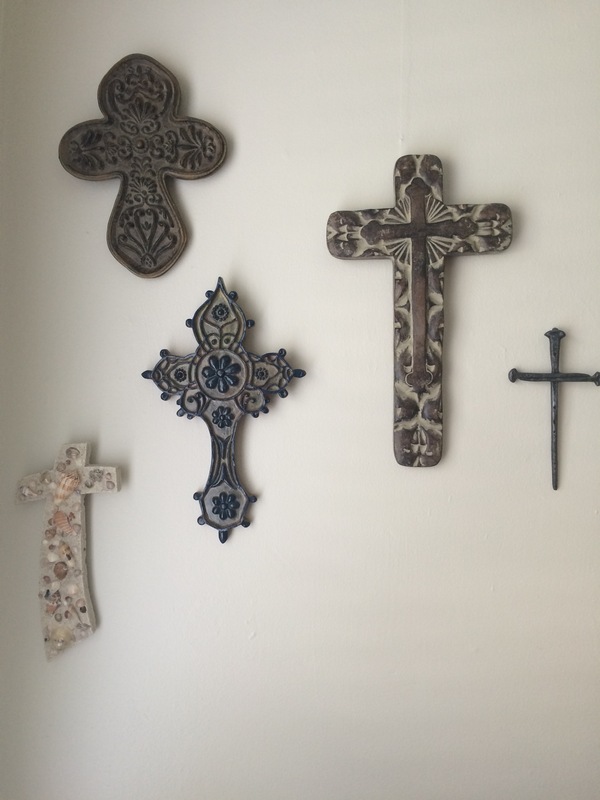 My friend Leslie, who blogs over at Once Upon a Time and Happily Ever After (link here), posted about her cross wall, and encouraged her readers to post about theirs. Since I have a cross wall, I decided to share mine as well. I first saw a cross wall at my friend Emily’s house, about 15 years ago. She had quite an interesting collection of different crosses. Then, more recently, another friend – Kim – had a cross wall in her house. She recently moved, and since I haven’t seen her finished house, I asked if she had put up her crosses in her new house. She had. Unlike Leslie’s crosses, mine don’t represent different people in my life. Not directly. My collection began accidentally. 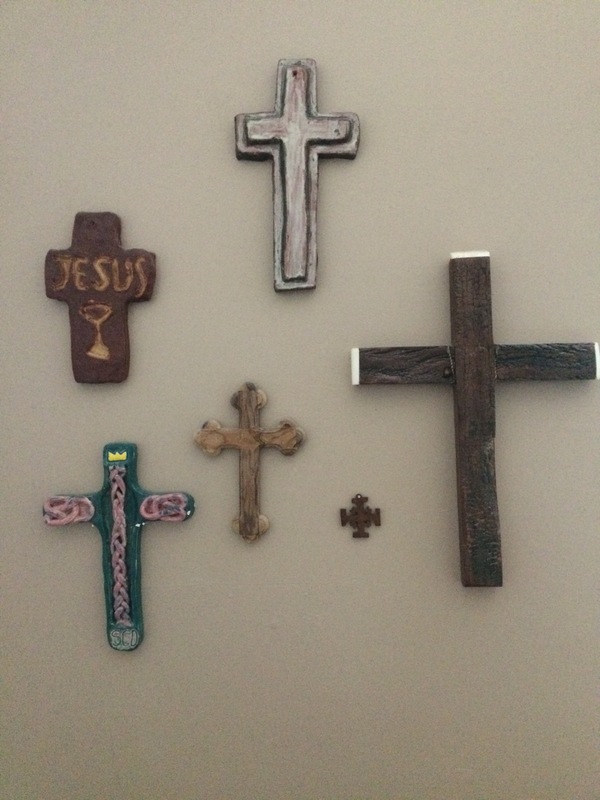 The first cross, the large wooden one to the right, I bought at church years ago as part of a mission support sale. It is handmade from Africa, and for several years it was the only cross on the wall. Then my boys were in an art class and they made two ceramic crosses. So those two joined the wall. The olive wood one we purchased in Israel on our trip there in 2010, as a souvenir. The little cross is also made of Israeli olive wood but it was a gift from our neighbor in Tampa. Later, my oldest child made another cross for me in his high school ceramics class and that, too, joined the wall. I’m not actively collecting crosses for collecting-sake but I do like that each cross is special and unique. Do you have a cross wall? Or know of a friend who does? Let me know if you do and what your crosses mean to you in the comments! Linking up with Leslie (link here). I loved Leslie’s Cross post and hearing the story behind each one and am glad to read another! Thank you for joining me, Sheila. How special your crosses are. And international! And handmade. Thank you for sharing your friend’s cross wall, too. Thank you for the inspiration Leslie! Love that your children made many of your crosses. I think that makes them so much more special. Yes, they are very special to me! Thanks for stopping by Carrie!